Remember when I said I was having trouble finding large glass lamps, so I resorted to my DIY glass bottle lamp? They aren’t as huge as my glass jar lamp, but still a really nice size. It’s nice to have a big statement lamp or two in a room! 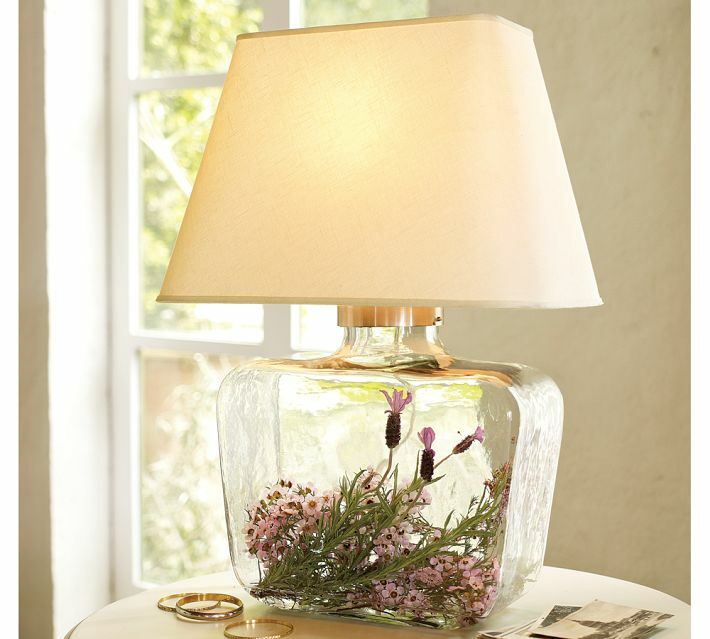 And the bonus of these beautiful glass lamps? They have a cork “lid” that comes off so you can fill the jar with something festive if you want to! I’ve seen similar lamps to these at Target recently. You can find them here or here! 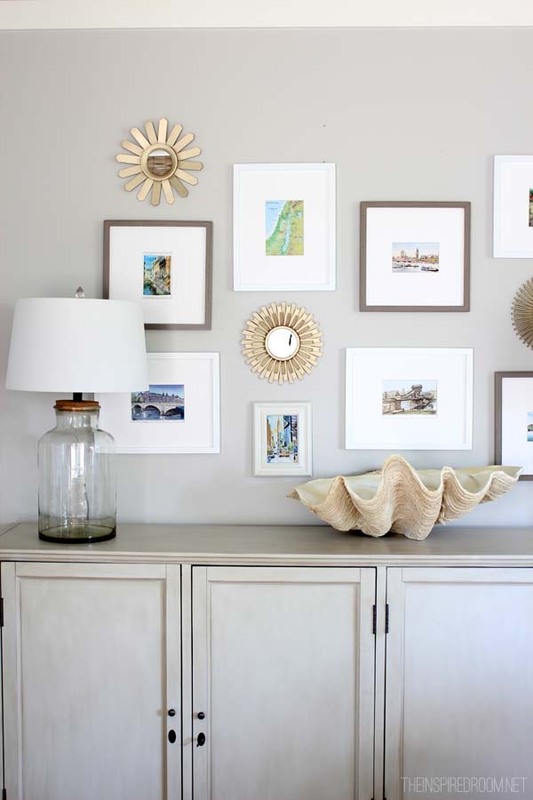 I like them just simple and empty, too, but I can imagine it would be fun to fill them with pretty Christmas decor, seashells, driftwood, pinecones, postcards, books, mementos or even use them like a little terrarium. 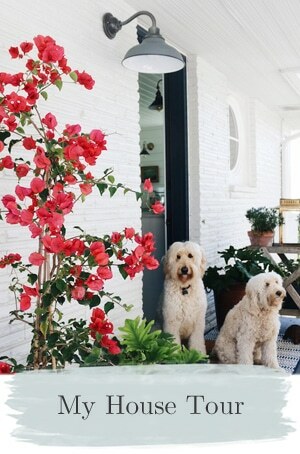 Or maybe I would opt for faux plants or flowers, just so they would be stress free! I haven’t filled mine with anything yet, but I did a little searching for inspiration. I’m sure I’ll be trying some of these out for myself! 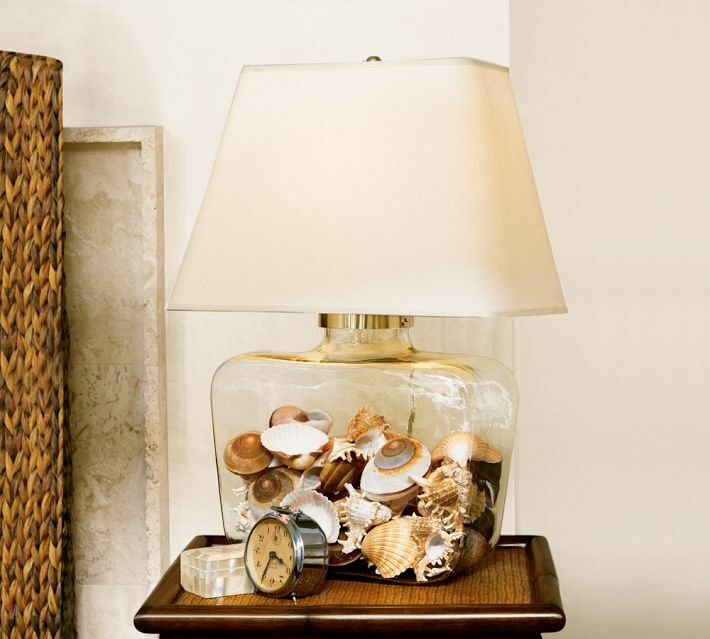 Below you can find some beautiful Pottery Barn lamps I really like with ideas of possible ways to fill them. 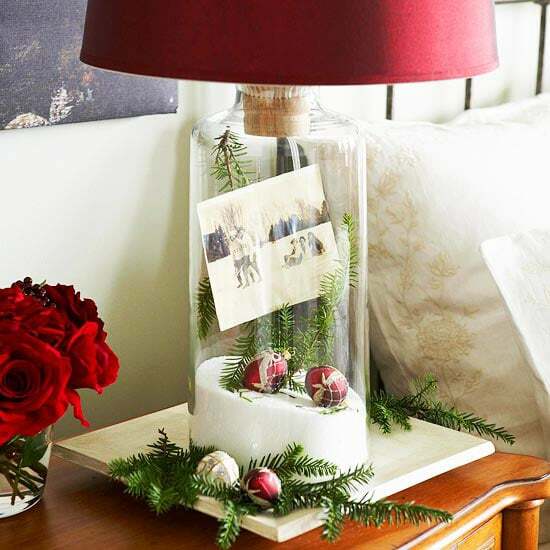 It’s fun to have simple ways to change your decor seasonally, don’t you think? 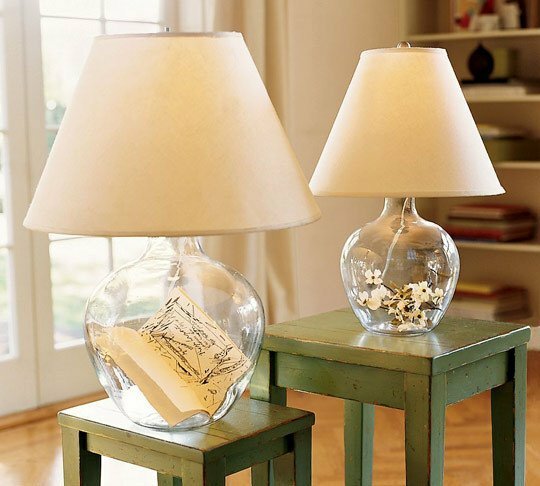 Find similar fillable lamps HERE! I love that you can fill the lamps for any occasion or leave them empty and they still look fabulous. I will have to take a visit to Home Goods to see if they have any more of those beauties. I love it! This is beyond beautiful and creative. Thank you for all the great ideas! :O That is the coolest thing I’ve ever seen! Simple, but effective – I love it. So pretty! 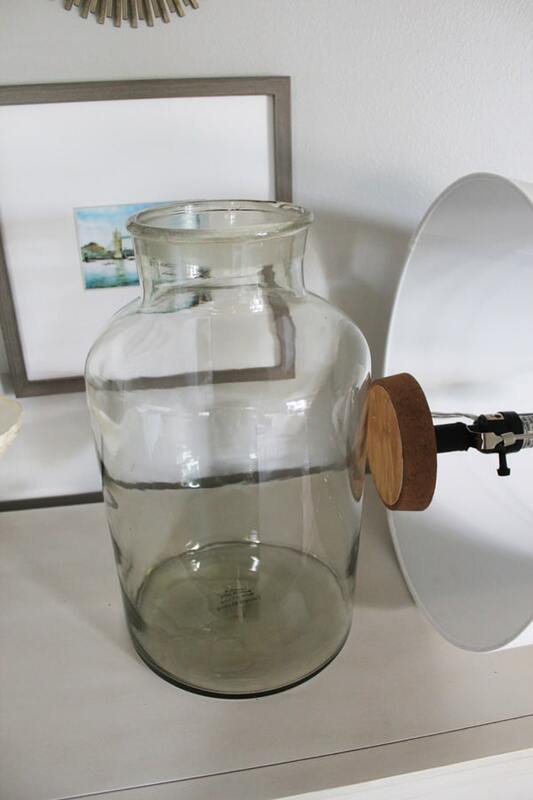 And what wonderful decorating ideas for them…I’m going to put one to work for my apothecary jar. 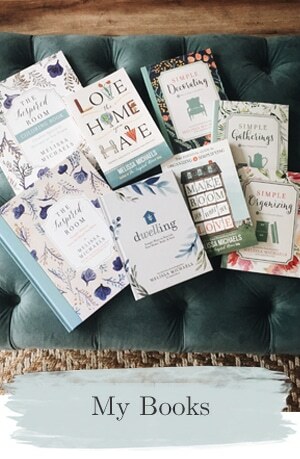 I really want to visit a HomeGoods store now! 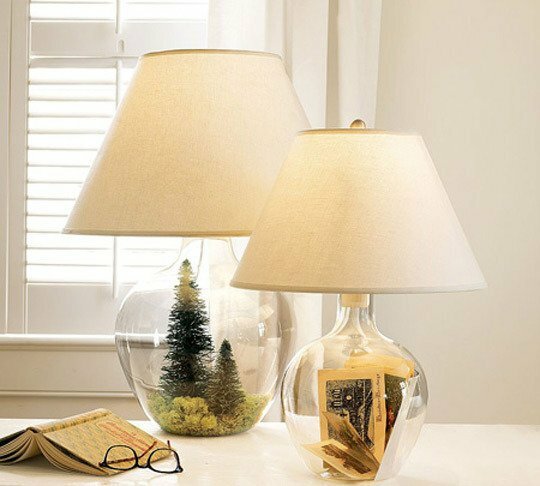 I really like these lamps and the inspiration photos of seasonal decor in them! Wow! I’m in need of bigger lamps for my living room…perhaps a trip to HomeGoods is on my horizon! Oh I love all the beauty in these pictures. Great ideas. Thanks. Happy Monday!! I am a sucker for lamps. I have way more than I need, and often rotate them around the house, storing some in the attic so I can swap them seasonally. Lamps are so much more than a light source. Those lamps you found at HomeGoods are fantastic. 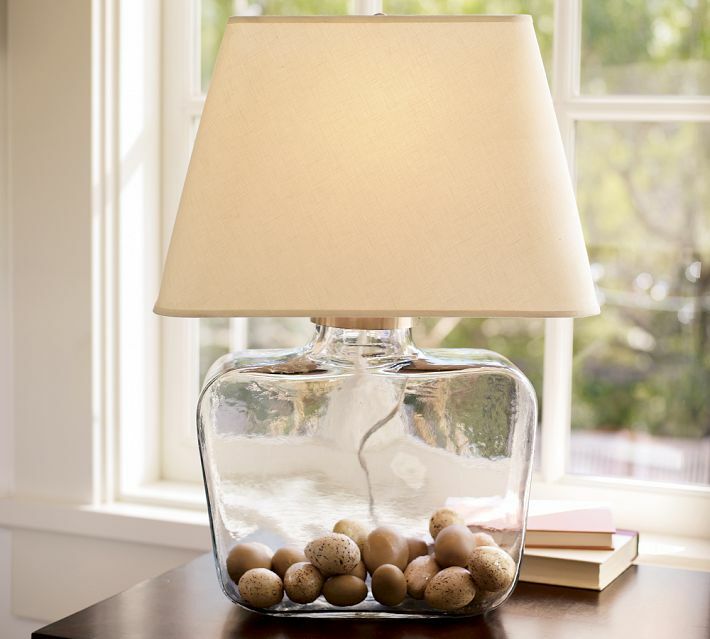 I’ve seen lots of glass lamps, and some aren’t terribly shapely, but yours are lovely. The pictures of all the filled lamps is inspirational. I wish I had more room for more lamps! Count me in on that trip to Home Goods, because I, too, am looking for lamps for a couple of Frenchie-stripe lampshades I just bought @ Pottery Barn! Imagine that. Coincidentally, I just mentioned this very quest in today’s blog post. What are the odds? I’ve always loved the glass lamps from PB. I shall fill mine with vintage baseballs! Go Cardinals! 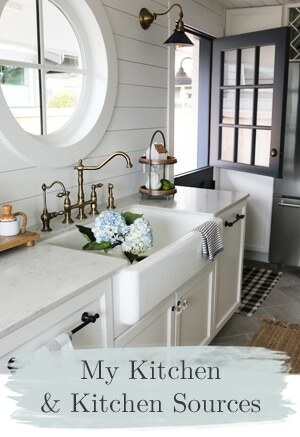 I am not an artsy person, but I subscribed to this blog because it is so beautiful. It gives me a break from my technology focused life. I am sharing this one because all kinds of ideas are percolating around these glass lamps.﻿ Thank you for brightening up my day! LOVE this idea. The seashell filling is my favorite, but layered sands might also be nice. Such a cute idea!! The Christmas ones are my fave. They’re beautiful on their own, but it would be fun to change them up a little from time to time. Your post is very timely for me also! I just received some light kits that ordered to make a couple of one gallon canning jars into lamps. (Since I can’t think of one thing I’d want to can an entire gallon of!!) I think they’ll be perfect for my farmhouse. I’ve been batting around ideas in my head of what to put in them and you’ve posted some beautiful ideas! 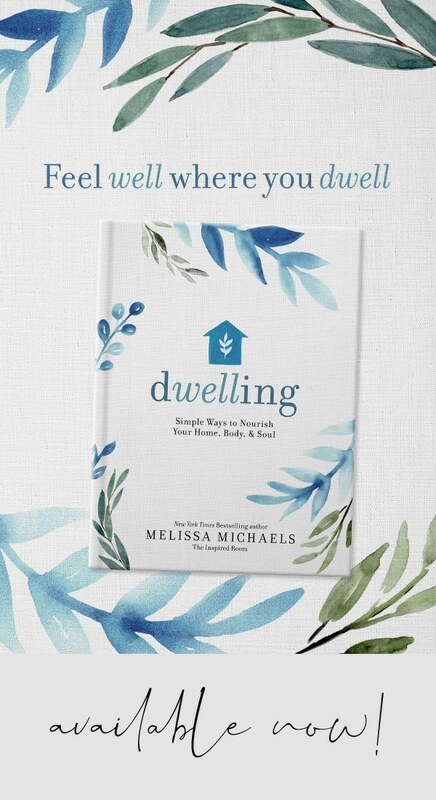 Mine will be placed on the two bookcases, on either side of the doorway in our newly re-done office. Honestly I was thinking of putting live Beta fish in mine but now I have to think that over again…may be too much stress, as you said, to keep cleaning them all the time. Hmmm the possibilities are endless aren’t they?! Luckily, I’ll be right next to a Home Goods tomorrow. These look absolutely stunning. I love that with your initial investment, you get endless decorating options relatively inexpensive. 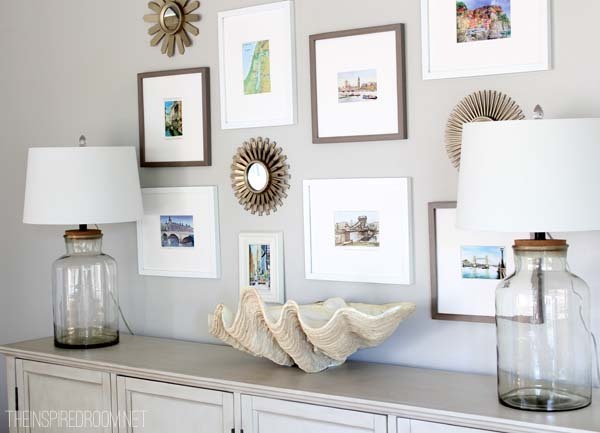 You could change it up every month and have a completely fresh look in any room. Thanks for sharing!!! Such a great neutral lamp that will age well. Great Homegoods find! I got one — actually two — of those Home Goods lamps, and I love it. Up I do want to point out though that those particular ones are REALLY delicate and thin. I shattered the first one into a million billion pieces when a not very heavy decorative ball I was putting inside gently hit the side the wrong way. I would like it more if it were much thicker glass. 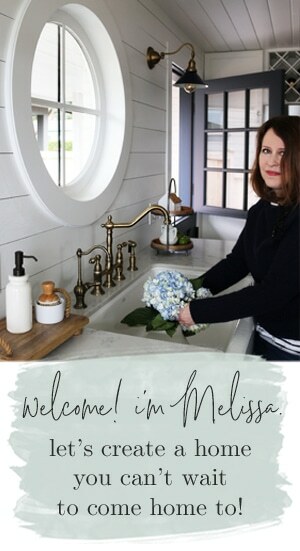 Beautiful, Melissa! I especially love the square atrium lamp with the flowers in it. Pottery Barn, while beautiful, is a little rich for my blood, though. I’m glad you mentioned that HomeGoods has some, too. Thanks for sharing. Indeed! Simple things are always the best and they sure will standout because of the uniqueness one could come up out of it. 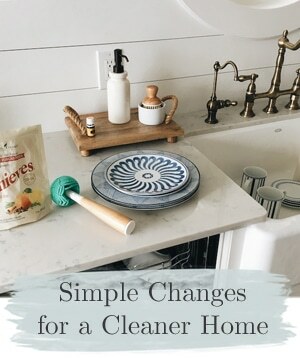 Compared to buying expensive stuffs to have an elegant design or decoration at home, there couldn’t be any better than using simple things – ’cause they are way cheaper! I just got one just like this at Target for $45-shade included! Score! In my opinion, the Threshold line can do no wrong! Awesome DIY lamp idea! Glad I stumbled upon your page! Hi all, I’m LOVING these lamps! I’ve been searching for this exact idea for years! I live in the UK and just can’t find anything like this here :( im worried about buying anything electrical from US because of the electrical conversion! Can anyone help? 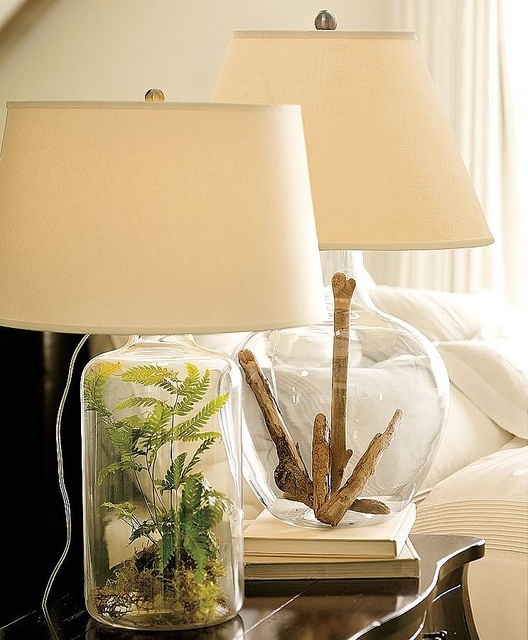 do you think that air plants would survive in a fillable lamp?